From THe streets Of IRAN !!!!!! 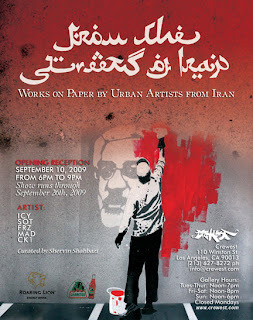 Los Angeles, CA - Crewest Gallery presents From the Streets of Iran, Works on paper by urban artists in Iran, curated by Shervin Shahbazi. 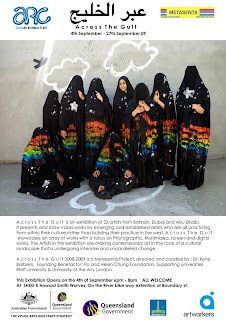 an Exhibition of 22 artists from the middle east will be helpd from 4 to 27th of September 2009 in Brisbane-Australia. During Past 5 years kolahstudio Has been Selling Art stuff and products of the basement down in rented Gallery Spaces and Internet To a serrie of collectores and Art lovers around the world. Since the increasing number of Contacts and works we decided to launch the Pain-things.com as the front store of the Website(KS) to show and represent Kolahstudio Art pieces (Originals,limited prints and comissioned) for those who are or may be interested to have one or a serrie at their collection. As you may already now KS and also Pain-things have a especial taste and not an easy /money oriented viewpoint onshowcasing Art products for . so we just try to keep limited to some serries of Art works we surley think they have some collecting values and have a story around. Being out of the mainstream and still being Bold and Effective is Always our Main goal …so we just Seek Our Own Goals…..